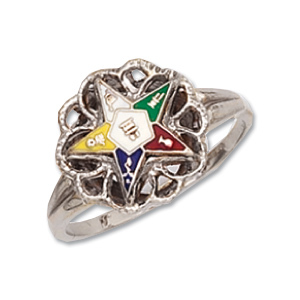 This order of the eastern star ring has a floral design. Polished sterling silver. Anti-tarnish sterlite. Color enamel accents. Made in USA. color came off a star point 2 weeks after wearing it. replaced and it happened again. Replaced it for a thirt time and the color came off again. Not happy at all. I really liked the affordability of the ring but I didn't like that it left a ring on her finger the first day she wore it.